Setting up and using bbPress is really easy once you know how and is a great way to provide a support forum for your users. 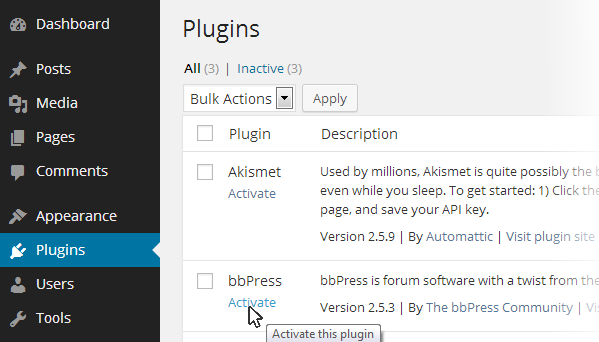 To get started all you need to do is install and activate the bbPress plugin on your site. Let’s show you how easy it is to set up and manage! 1. Go to Forums > New Forum once you’ve activated the bbPress plugin. Forum Title: Choose the text you want to display at the title of your forum. Forum Description: Choose the text you want to describe the uses or content for your forum. 3. Adjust your forum attributes. 1. Type: Forum or Category. 2. Status: Open or Closed. 3. Visibility: Public, Private or Hidden. Type: Can be forum or category. Categories can only contain forums and you can use categories to organize your forums. Status: Used to control if the forum is open or closed. Once a forum is closed no one is able to start new topics or reply to a topic. Visibility: Controls whether your forum is public, private or hidden. Public: Anyone can see the forum. Private: Only logged in users can see the forum. Hidden: Only Moderators/Admins can see the forum. Forums can have a hierarchical structure and you can use this to organise your forum i.e. you can make a forum a sub-forum of another Forum or a child of a category by selecting a Parent. The order determines what the order the forums appear on your forums page. 4. Click Publish when happy with changes. For my example I’ve kept all attributes the same except assigned this forum the order 1 so it appears at the top of my forums page. 5. Repeat this process, from step 1 to 4, to create all your forums. All the forums you create are listed on Forums > All Forums. Here’s a comparison of options for organizing the hierarchy of your forums. 4. Create a custom link for home by adding your site URL, the name Home and click Add To Menu. 5. Create a custom link for forums by adding your forums URL, the name Forums and click Add to Menu. 6. Select the pages you want to add to your menu then click Add To Menu. 7. Now drag/drop the menu items to change their order in your menu. 8. Once you’ve finished changing the order click Save Menu. 9. Now to display your new top navigation on your site you just need to select Main from under the Primary Navigation drop down menu and then click Save. Once your forums are created you and your users can add topics to the forums. Topics are the issues that are being discussed on your Forum. Topics can be added directly from the front end or from inside the WordPress dashboard via Topics > New Topic. 1. Go to your forums page on your site. 2. Click on the forum you want to create a topic in. If you’ve just set up your Forum it will have no Topics yet. 3. Add your topic title, your topic content and click Submit. Tags: You can add tags to organise topics. Topic Type: Topic types are Normal, Sticky and Super Sticky. Sticky posts stick to top of the Forum which it is in. Super Sticky posts stick to the top of all Forums. Notify me of follow-up replies via email: You select if you want to receive email notifications of replies. As a Key Master, administrator or moderator you have higher administration privileges in your bbPress forum. This allows you to manage topics from the front end and from within your dashboard. Logged into your account you’ll see Edit, Close, Stick to Front, Merge, Trash and Spam displayed at the top of a topic when viewed in the front end. Edit: Allows you to edit a user’s topic. Close: Used to close a topic when the issue has been resolved or dealt with. Stick to Front: Allows you to stick the topic to the top of your forum. Merge: Used when you want to merge topics together. Trash: When you want to delete a topic. Spam: To spam a topic. Replies are the responses to topics that are being discussed on your Forum. Replies can be added directly from the front end or from inside the WordPress dashboard via Replies > New Reply. 1. Click on the topic you want to respond to. 2. Add your reply and click Submit. As a Key Master, administrator or moderator you have higher administration privileges in your bbPress forum. This allows you to manage replies from the front end and from within your dashboard. Logged into your account you’ll see Edit, Split, Trash and Spam displayed at the top of a reply when viewed in the front end. Edit: Allows you to edit a user’s reply. Split: Used when you want to split replies. Trash: When you want to delete a reply. Spam: To spam a reply. Only logged in users can participate in bbPress forums unless you have allowed Anonymous Posting in Settings > Forums. By default, bbPress doesn’t allow Anonymous Posting because you can have issues with spammers. Their level of access in your forum is controlled by the forum role you’ve assigned them. Super Admin – can create and edit forums across a WordPress Multisite network. Able to edit other users’ topics and replies, and has access to moderation tools. Key Master – Whoever has the highest WordPress capability on a site is automatically assigned the role of Key Master. On a Multisite installation it is the Super admin user and on a single WordPress site installation it is the administrator. Able to edit other users’ topics and replies, and has access to moderation tools. Administrator – can create and edit forums on that site. Able to edit other users’ topics and replies, and has access to moderation tools. Moderator – can create, edit and delete topics and replies. Can manage Tags, and moderate a Forum. Editor – can publish and edit their own topics and replies An editor cannot edit bbPress Topics and Replies of others. Author – can publish and edit their own topics and replies. Contributor – can publish and edit their own topics and replies. Participant – This is a WordPress Multisite role only. This allows the user on one site of a network to participate in a forum on another site on your network without having to register on the other site. Participants can publish and edit their own topics and replies. Spectators – Can view the forum, but cannot contribute. Blocked – Prevent them from being able to view (and contribute) your forums. 1. Go to Users > All Users. 2. Select the user, choose their new role from the ‘Change role to’ dropdown menu and click Change. You can access your widgets by going to Appearance > Widgets on your dashboard. (bbPress) Forum Search Form: Provides a simple way to search for specific content within your entire forum. (bbPress) Login Widget: A simple login form with options to add links to your sign-up and lost password pages. (bbPress) Recent Topics: Displays a list of the most recent topics. (bbPress) Topic Views List: Displays a list of registered optional topic views. (bbPress) Forums List: Displays a list of forums with an option to set the parent. (bbPress) Recent Replies: Displays a list of the most recent replies. (bbPress) Statistics: Displays some statistics from your forum. You can customise your settings for greater control over your bbPress forums by going to Settings > Forums. Disabling editing after: Controls the length of time all users, other than Key Masters, Administrators and moderators, have to return to a topic or reply they’ve submitted to make further edits. Throttle posting every: Sets the minimum time between posting new replies in your forum. This is important for preventing spammers and for controlling disruptive users. Allow anonymous posting: Enabling anonymous posting means any site visitor can post a new topic or reply without the need of logging into your site. They are still required to enter a name and email to post, but will not be required to create a username or password and won’t be shown in the list of WordPress Users. By default, bbPress doesn’t allow Anonymous Posting because you can have issues with spammers. Auto Role: Designed to automatically assigns the default role to new, registered users upon visiting the site. Revisions: Controls is revisions are logged. Favorites: Allows forum participates to ‘favorite’ any topic so they can review them later for their forum profile page. Subscriptions: Enables participants to be able to subscribe to email notifications. Topic Tags: Allows you to assign tags to topics. Search: Allows forum wide searching. Post Formatting: Add toolbar & buttons to text areas to help with HTML formatting. Auto-embed links: Allows users to quickly embed videos, images and other content such as Tweets, YouTube videos and Scribd into a topic or reply using their URL using oEmbed. Reply Threading: Allow nested replies up to a specified number of levels deep. Per Page and Per RSS page: controls how many appear.